Prescription medication can be extremely useful for dealing with various health conditions, but it doesn’t come without its own dangers and potential risks—especially when there are children in the home. Here are some dos and don’ts that you should know before beginning to take prescription medication or before bringing prescription medication into the home. Do take only the prescribed dosage. This one should go without saying, but it is worth the extra reminder. Be sure to study your medication dosage carefully and to follow your doctor’s instructions to a T. Sometimes the prescribed dosage is more complicated than simply “take one pill per day,” so determine whether there is an “ease-in” or “wean-off” period, instructions concerning the time of day, etc. before you start taking your medication. Do follow the full course of treatment. On a similar note, it’s important to follow the full course of treatment as prescribed by your doctor, even if your symptoms seem to have disappeared. If you’re looking to cut back or stop using a certain medication, call your doctor first to see if this is possible. Of course, is if you begin experiencing any unusual side effects after taking your medication, you should call your doctor immediately. Do take the medication exactly as prescribed. Often there will be instructions regarding how to take the medication as well, such as with plenty of water, after a meal, shortly before bed, etc. So in addition to ensure that you are taking the proper dosages, be sure that you are taking each dose as prescribed, as well. Do educate yourself on your medications. Many of us will memorize the medication name and prescribed dosages for our medications, but fewer of us actually take the time to learn the details about the medications we take. Whenever you start taking any prescription medication—or even just an over-the-counter prescription, for that matter—be sure to take the time to go through the educational material that comes with it. Learn about the generic and brand names of your medication; the medication classification; potential side effects; shape, color, and imprint on pill; and other special instructions. It can help to create a chart with this information for all of your medications so that you don’t have to try to memorize everything. Do watch for unusual side effects. With this knowledge in mind, be sure to watch for any potential side effects as you take your medication, even if you have been taking your medication for years. Do order your prescriptions from the same pharmacy. You should always talk with your doctor about any medications (prescription or over-the-counter), supplements, or vitamins you are currently taking so that your doctor can ensure that none of your medications will interact with one another. In addition to this, it’s a good idea to order all of your prescriptions from the same pharmacy; this will serve as an extra protection against dangerous drug interactions. Do store medications in a cool, dry place. Do keep medications away from children. You may know how to exercise caution around your medications, but that does not mean that your child does. Be sure to keep your prescription medications hidden and out of reach of children. This becomes important as your children enter their teenage years, as well, as many high school age children begin experimenting with abusing prescription drugs at this age. Do dispose of your medications correctly. If any of your medications become unnecessary, old, or expired, you should dispose of them immediately. Did you know that there are right and wrong ways to dispose of your medications? Medicine take-back programs are a great way to dispose of unwanted medications; simply look for a DEA-hosted National Prescription Drug Take-Back event in your area. Local law enforcement sometimes hosts these events as well. If you can’t find an event in your area, you can also go to a DEA-authorized medicine collector—often at retail pharmacies, hospital or clinic pharmacies, and law enforcement locations. You can visit the U.S. Drug Enforcement Administration website to find more information about drug disposal in your area. Don’t move your medications from their original containers. The original container for your medication contains vital information about the medication. Keep your medications in their original containers so that you always have access to this information and so that others will not take your prescription medication by mistake. (This can easily happen if you move your medication to an Altoids tin, for example.) One exception to this is if you use a weekly pill box. 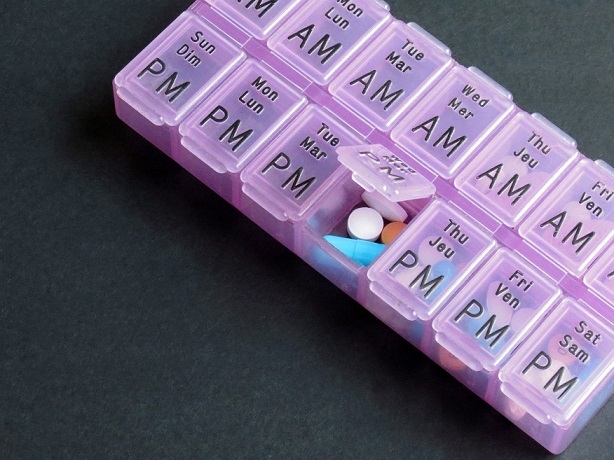 A pill box is a great way to ensure that you are taking all required dosages of your medications; just be sure that even then you are only moving the proper dosage of medication from its original container on a weekly basis. Don’t give anyone else access to your medications. This tip is essential, and it cannot be stated enough: be sure not to give anyone else—even family members—access to your medications. Never take a prescription medication that has not been prescribed to you, either. What helps one person may very well have the opposite effect on someone else, and unfortunately many people develop drug prescription addictions by taking medications that are not even prescribed to them in the first place. In fact, prescription drug dependency is one of the leading causes of death in the United States today. You can read more about the dangers of prescription drug addiction here.